Butternut squash has fall written all over it! I recently harvested several perfectly ripe gorgeous butternut squash. We had a lot of fun sharing the abundance with neighbors, and are loving the tasty fall recipes. Stuffed butternut squash, butternut squash chili, and butternut squash rice with herbs are a few of our favorites. 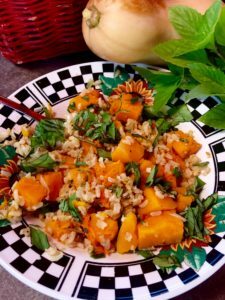 Butternut squash rice with herbs is a fall favorite at our house. Click here to watch a YouTube video on how to make butternut squash rice with herbs – mmmm!) Whenever I take a bite of this super flavorful winter squash, it just screams out FALL! 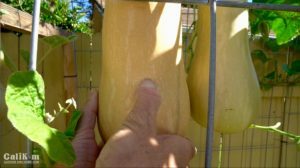 Wait to long to harvest and butternut squash can split. 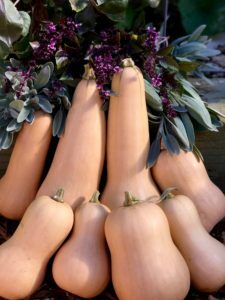 However, if you’re a first time butternut squash grower, you might be wondering “When is the best time to harvest?” Nothing more frustrating than harvesting it too soon and it’s not ripe. Or maybe you have waited too long to harvest yours, and it splits. No worries, with a few simple tips, you’ll be harvesting your butternut squash like a pro and soon will be making all kinds of delicious meals with this flavorful winter squash. Butternut squash is a winter squash and grows best when planted in the spring. 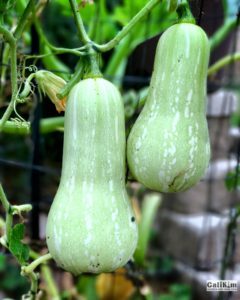 It loves the warm weather of summer and takes 3-4 months to grow to maturity, unlike it’s tender skinned summer squash cousin. Being a winter squash doesn’t mean it’s grown in the winter, but rather harvested in the fall as winter approaches. Follow the following 3 tips to make sure your butternut squash is perfectly ripe and lasts all winter long. A ripe butternut squash has a deep tan color. Butternut squash that is green is not ready to harvest. A ripe butternut squash should be a deep tan color, with minimal green striping near the stem. If your butternut squash is green, with dark green striping, it’s not ripe. Wait a few weeks, and when you notice the skin change color, it’s time to check the other harvest tips. The stem should be brown, tough and shriveled. Another sign that your butternut squash is ready to harvest is when the stem is brown, tough, and shriveled. If the stem is green, soft and not shriveled at all, it’s not ready. The skin should be hard to pierce with your fingernail. Check to see if you can pierce the skin of your butternut squash easily with fingernail. If you can push your nail right through the skin, it is not ready to harvest. It is ripe when it’s difficult to pierce the skin with your fingernail. Harvested at the right time, when the skin is tough, helps it last all winter long. The time is right – harvest! Follow these three tips and you are ready to harvest! 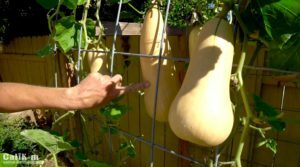 Using a sharp pair of pruners, cut the stem off the vine about an inch above the butternut squash. Stored on a counter top, ripe butternut squash will keep well for about 6 months, longer if it is stored in a cool, dry place, such as a basement or root cellar. 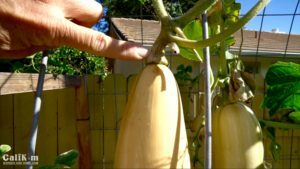 Watch the video from my YouTube channel, “How to Harvest Butternut Squash” so you can see exactly how to harvest yours. While you visiting my channel, subscribe and hit the bell icon so you get notifications when I post new garden how-to videos. More garden to table recipe videos coming soon! Comment below, let me know if you’re growing a butternut squash and how you like to eat it! 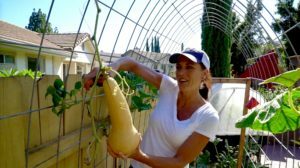 I harvested 16 beautiful butternut squash last week! This year was the first time I grew them. Can’t wait to try some of your recipes out! Have you been able to plant in your Smart Pots container yet? Congrats on winning. You will love it- hope you grow lots of veggies! Keep me posted! Hi Pat – wow, what a haul! Have you been able to try any of the recipes out yet? Our fav is Butternut Squash Rice – check out the latest blog post for all the details! Happy gardening! You can Good Dirt at http://good-dirt.com. It is truly the best garden soil I have used, I know you will love it too! Looking forward to hearing how your fall planting goes! Thanks for the questions! First, try taping the break then slinging the squash to the vine even if its just barely hanging on-nature is incredible!! As well, if a critter has broken through the skin, deep into the flesh I don’t eat it, if there is a small nick or peck I will just cut it away- but you might want to research further. Thanks for the support! 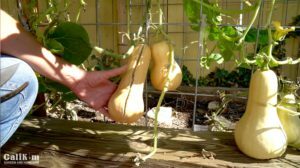 I am a 64 year old Delaware gardener and I planted butternut squash for the first time this year. I planted 4 hills of three seeds each 6 feet apart at the end of May. These plants are now known by my siblings and neighbors as “Squashzilla” or “The Squash that ate Delaware”. These plants took over almost my entire 1500 sq. ft. Garden plus another 2500 sq. ft. of lawn. I have harvested 7 so far and there are another 52 that I can see right now. If I ever plant these again, they will be somewhere by themselves. Thanks for the info on when to harvest them. Your so welcome and congratulations ?? on you’re super green thumb!